“Rick’s” featured awesome music and a laid-back setting. Well, yes, there was gambling, too, but the great jazz music was a big draw. The truth is we can get the same swinging tunes right here in Central Illinois, even if there’s no gambling or airplane waiting on a foggy runway. 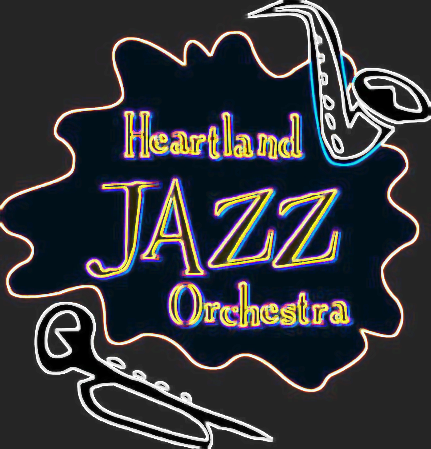 On the last Thursday night of each month, the Heartland Jazz Orchestra grooves and sways its audience with new numbers and old classics. Under the direction of Thomas Wirtel, the 21-member band is about to enter its fourth year. Brian Choban of Bloomington has played the trumpet with the group since its beginning. A trumpet player since the fourth grade, Brian joined because he could continue to play an instrument he loves without having to go on the road with a traveling band. Heartland Jazz Orchestra takes its role as a community organization seriously.Each month, the group sponsors an outreach program by paying for a guest artist to join them at the Coffeehouse concerts. And the band hosts free clinics for students learning to play jazz. Last week, Dr. Todd Kelly, assistant professor of trumpet and jazz at Bradley University, joined the band for an evening performance. Prior to the concert, he directed a jazz improvisation workshop at Chiddix Junior High School for about 60 students from all over the Twin Cities. “This is a great way to infuse the love of jazz into our younger players,” says Choban. Tim Byrne of Bloomington has been a trombone player with the band, also since the group’s first performance. “I played in school, and this orchestra gives me the chance to continue playing.” he says. Some of the band members are still playing in school. Lindsay Wade, 17, is a junior at Central Catholic High School and has been playing the upright bass for a year and a half. “The original director of the band (Doug Tidaback) was my band director and he encouraged me to play,” she said. Not only is Lindsay one of the youngest band members, she is the only female playing an instrument. 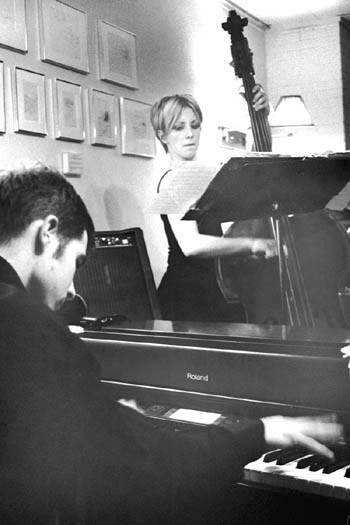 And it’s such a large instrument – much larger than her petite frame. “Sometimes I get a little nervous right before playing because everyone in the band is such a great musician,” she says. But when the rest of the band starts jamming, her nervousness melts away and Lindsay is right in there, too. The band’s easy-going attitude is evident in its music. They’re all having fun and it shows. The band, plus vocalist Kristin White, puts on an impressive show. The regulars who attend the monthly performances are loyal followers. The band performs at weddings, dances, festivals, fund-raisers; anywhere there’s a crowd pining for jazz music. And that includes New Year’s Eve. On Dec. 31, 2001 the band will be ringing in the new year in high style, throwing a Big Band Bash with WGLT at the Interstate Center Ballroom.